What is the name of your blog? How did you pick your blog’s name? He Follwed Me Home...Can I Keep Him? When I was a kid, I had a tshirt that had a picture of a girl walking a monster on a leash and said "It followed me home, can I keep him?". I had no idea what to name my blog but that popped into my head...only now it's not random pets but books that end up coming home with me! This August will be my 2 year blogoversary! I can't believe how fast time flies! Success to me is having people read your posts, seeing regulars who come back for more and still being excited to post on the blog. Followers is a catch 22 - I try not to focus on it but know that it's important to have your voice heard too. I am an eclectic reader but I have a soft spot for YA. I love the character growth and coming of age stories as I suffer from Peter Pan syndrome and doubt I'll ever grow up :D I generally avoid the darker reads, I like books that make me feel good! I'm finally reading Anna and the French Kiss!! I knew I'd love this one so kept it for a time I needed to get myself out of a book slump. Do you use social media to promote your blog or discuss reading/blogging? Yes I do! I keep track of all my books on Goodreads and add my blog reviews there. I'd have to say that Twitter is my favorite place to find new books and bookish people. I recently added a Facebook page for my blog. Karen: I'm with you there! Twiiter is the place to find out and talk about books almost instantly 24/7! I love sitting outside to read during the summer. As much as I love reading in bed, I always end up reading 10 pages and then fall asleep! A comfy place to sit with few distractions. I'm all for them if there is a reason for it! I tend to like to nice boys but always fall for the bad ones ;) A good love triangle has the ability to show so much character growth & be fun! Thanks Mel! 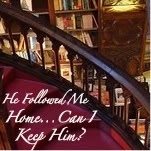 Be sure to stop by He Followed Me Home....Can I keep him for Mel's 2 year blogging celebration and Giveaway! Blogger's don't forget to link all those August reviews HERE! More Better Know A Blogger participants coming up!! Julie ~ I totally would, wish you lived closer!! And I was excited to see this since I just met Mel on Wednesday evening! Tiger ~ I like living in a bubble where nothing bad happens, bad books are no fun! Brenna ~ It was great to meet you IRL earlier this week! We should do that again, fun times!